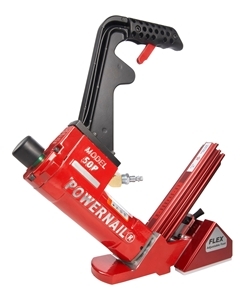 This Powernail factory refurbished model comes with a 90-day warranty. The most versatile hardwood flooring nailer in the industry, the Model 50P FLEX installs solid, bamboo, exotic, and engineered flooring. Mechanically adjusts from 3/8” to 3/4”. The 18 gage cleat is designed to reduce cracking or splitting of the tongue.